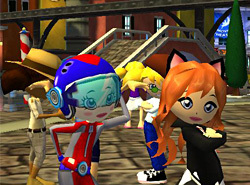 The Jumpee Creator: The Jumpee Creator is an interactive menu where players are able to fully customize their in-game avatar, known as their Jumpee. After choosing their Jumpee’s gender, kids are encouraged to choose from a variety of accessories, hairstyles, facial features, seasonal fashion options, and so much more. This fantastic feature allows players to express themselves in a unique and exciting way. 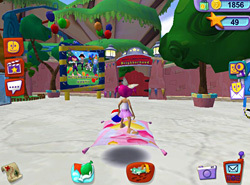 The Jumpee creator is accessible at any time and can be opened from each player’s character dock. 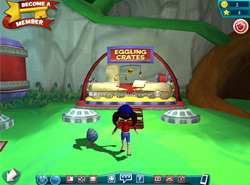 Within the Jumpee Creator, players also have direct access to JumpStart’s Threadz store where they will be able to buy new items to customize their Jumpee’s look. 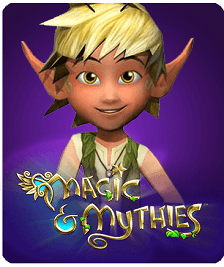 Choosing a Name: Jumpee usernames are created when players begin to build their fully customizable avatar. Usernames are generated using our JumpStart “Name Randomizer”, which allows Jumpeez to create two or three word name combinations that are used to identify players both in game and through player submissions or fan features. These fun yet generic usernames allow kids to safely create their own identity without having to share personal or identifiable information while online. Players are able to change their name at any time, by selecting their communicator and using the “Name Change” button. 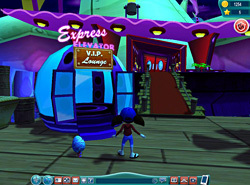 Earning JumpStars and Ranking Up: To rank up players will need to play through missions like those found in areas like StoryLand, MarineLand, AdventureLand, FutureLand, and Penguin HQ or complete other in-game tasks to earn JumpStars, achievements, and unlock special features around the game. A player’s rank is then determined by the number of JumpStars they have earned overall, which can be viewed using the counter in the upper right hand corner of the gaming window. 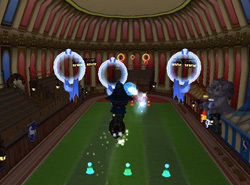 Top ranked players are then placed in our Jumpee Hall Of Fame, which can be opened by selecting the Communicator and clicking on the “JumpStars” button. 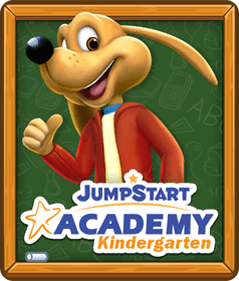 Earning Coins and Customizing the Game: In addition to JumpStars, Jumpeez are also awarded coins for playing games and completing in-game tasks. To view the number of coins that a player has already earned, Jumpeez can look to the coin counter in the upper right hand corner of their gaming window. Double clicking on the counter will also open up a menu, listing all of our JumpStart stores. Players are encouraged to purchase store items to customize their gaming experience with new Threadz, Petz, Ridez, wands, Mythie accessories, furniture, and so much more. Kids are able to increase their earning potential by competing in more of our learning games and missions. Adding Buddies: There are two ways for kids to safely add real world buddies and new online friends in JumpStart. Additionally, parents can always view and manage their kids’ Buddy Lists using the “Manage Kids” option listed in their account settings. 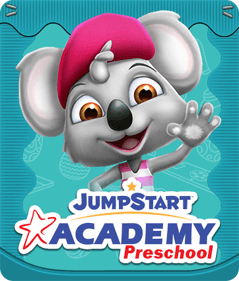 Jumpeez can be added to a buddy list using each player’s unique Jumpstart Buddy Code or by simply selecting another Jumpee and hitting the add button on their corresponding “About Me” page. Adding a friend to your Jumpee’s Buddy List allows players to see when they are online and quickly access them for game challenges, visits, and messaging. 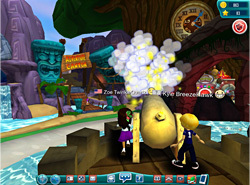 Exploring the World: Players can manually navigate our online world by using the arrow keys to direct their Jumpee. 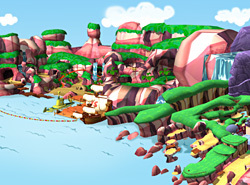 For quicker access to certain areas or lands, players are also encouraged to use the JumpStart Map on their character dock to teleport directly to their chosen location. There is even a Quick Launch menu, which gives Jumpeez direct access to some of our most popular games. There are so many things to do and see, so keep exploring! 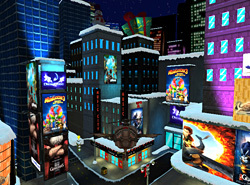 JumpStart, New York: In JumpStart, kids can walk through the bustling streets of New York to take in the famed sites and sounds of the Big Apple! As they explore, Jumpeez have the chance to spot iconic NYC yellow cabs or hang out in the local coffee shop. There are even great JumpStart games to play like Sushi Chop. Central Park: JumpStart’s Central Park is a great place for Jumpeez to gather and catch up with friends. 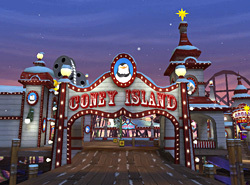 Here, players will find the gates of the famed Central Park Zoo from the DreamWorks’ film, Madagascar. 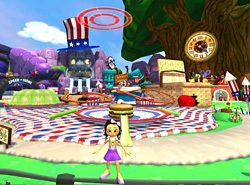 The Park is even home to one of JumpStart’s famed seasonal FunZones, which are exciting interactive areas where players can relax and have some fun. Located on the outskirts of the park, the coffee shop is an open space where Jumpeez are invited to interact with friends. Whether players choose to jump behind the counter or take a seat at one of the café tables, the Coffee Shop a fun space to explore and play. 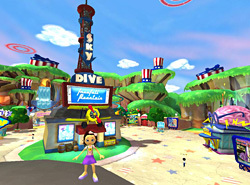 JumpStart’s FunZones are areas where Jumpeez can enjoy some simple “Just for Fun” games. These interactive areas are periodically updated with fun seasonal activities that are relevant to real world changes in season, holidays or current events. In Sushi Chop, players are asked to help Rico slice up some sushi for the Penguins. As the clock winds down, the more sushi that Jumpeez are able to slice into the basket, the more points they will be able to earn. Jumpeez will have to watch out for any falling dynamite, since slicing one of these will result in players losing points. Try cutting up the sushi that Rico’s thinking about for some extra earning potential. The JumpStart Times is the best source for in-game news. This popular newspaper allows kids to read Jumpee submitted articles, riddles, and stories, catch up on the latest in-game news including game spoilers, check out the Photo Bomb of the Week features, and have direct links to the HotSpot of the Week. The Central Park Zoo: The Central Park Zoo is located in the heart of JumpStart, New York. 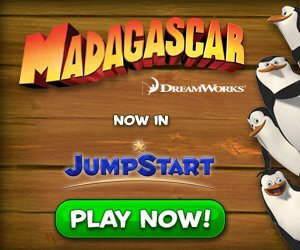 Here, Jumpeez can meet with their favorite characters from the DreamWorks’ film, Madagascar. Alex, Marty, Melman, and Gloria are waiting, in their own personalized areas of the zoo, to teach kids fun animal facts and challenge them to work through some silly slide puzzles. From here, Jumpeez will be able to access Penguins’ HQ and the European Habitat. 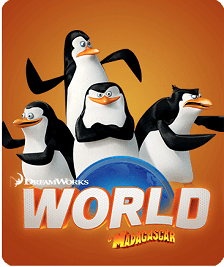 Penguins’ HQ: Located under the Penguins’ Habitat in the Central Park Zoo, HQ is where Jumpeez can find Kowalski’s Transmorpher or begin training on top secret missions alongside the Penguins. Just select the Missions board to get started. 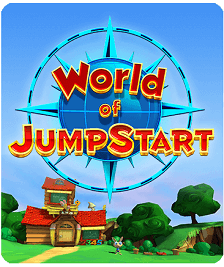 After completing a few simple tasks and becoming familiar with the Toolkit, Jumpeez are invited to embark on interactive adventures throughout the JumpStart World. Aaaagh! Nature! Get it off! Sign of the Times: Air Penguin Flies Again! The Zoo Nursery is where the younger versions of Alex, Marty, Melman and Gloria can be found. 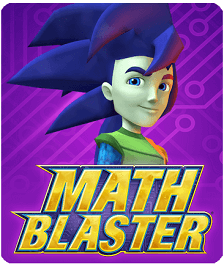 To make learning less intimidating for our younger Jumpeez, the Zoosters encourage even the littlest of learners to take on exciting learning games. Play Hidden Treasure Hollow by riding deep into the canyon mines to find treasure. Player will be able to use the 5 mining picks to unearth gems to earn coins. But, beware, some treasures are actually coal. 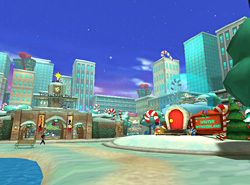 Play Ghost Town Grab for some extra coins and race to the finish to collect bags of coins and bars of silver or gold. Face the challenge of The Quizniator to earn an Ant ride. 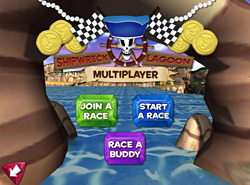 Play Shipwreck Lagoon, a pirate themed racing game that allows Jumpeez to hit the tracks, build their own courses, or engage in head to head challenges against Jumpee pals. Jumpeez can choose to race on any premade tracks or the top ranked tracks created by other players. Before the race starts kids are able to select their boat of choice and customize its color. The Learning House: The learning games included in this area are Balloon Sorting, Barnyard Fun, Bug Catcher, Bunny Fun, Connect the Stars, Critter Creator, Lunchbox, Matching Duckies, Matching Kites, Matching Ladybugs, Monkey Drop, Present Search, Puzzle Surprise, Retell a Story, Sound Box, Treasure Chest. Play Hops’ JetPack learning games to earn coins. Hops Jet Pack learning games. There are three levels, spanning the curriculum of kids ages 5-8. Subjects include reading and math. Practice getting around those pesky Punk Punks and learn how to send them away. Fish Release: Fish release is also know as the aquarium control panel. 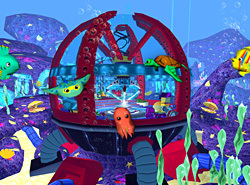 It is where Jumpeez can add sea creatures to the underwater refuge that surrounds the sea lab. 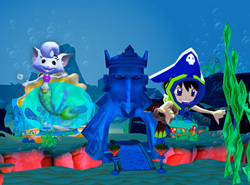 Before playing Fish Release, Jumpeez can buy sea creatures from their Communicator’s virtual store. The Time Slicer Time Machine: To help Dr. Brain, Jumpeez must complete missions in either the Ancient or Industrial Eras. 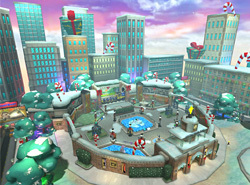 Within each Era, there are 5 Zones, where players will need to accomplish fast paced tasks and ultimately banish the menacing henchmen at the end of each course. The Learning Games Computer and IQ Actionizer: This computer has two levels. Level one is designed for 3rd and 4th graders while Level 2 is perfect for 4th and 5th grade learners. 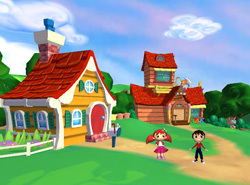 Within each level, players have the option to focus on a range of subjects like Language Arts, Math, Science, and Geography. The ‘Re-dresserizer’ is the quick-change station available to Jumpeez in FutureLand. No matches were found… Try “giza”.